Janie Bress - My North Shore Blog: Have a Safe & Happy Halloween on Chicago's North Shore! Have a Safe & Happy Halloween on Chicago's North Shore! It’s hard to believe we’re nearing the end of October and that autumn is in full swing here on Chicago’s North Shore. I enjoy this time of year as we hang on to the last few warm days and the changing leaves offer scenic views in every direction. As a North Shore Real Estate agent, it’s easy for me to talk with buyers relocating to Deerfield, Winnetka, Northbrook, Glencoe and Highland Park and other North Shore communities about what makes this area such a great place to call “home.” The North Shore’s great location near the metropolis of Chicago, beautiful neighborhoods, an endless supply of restaurants and shops, along with fun festivals and events throughout the year are just a few of the highlights of living on the North Shore. 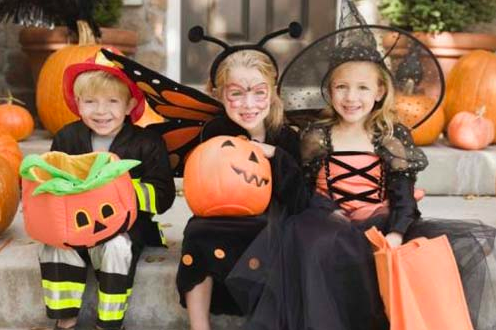 If you are new to the area, are considering moving to the North Shore or are simply looking for a way to get out in the community and take part in a few fun Halloween events this weekend; you won’t want to miss these family friendly activities! - Filled with chills and thrills, this family-friendly event features carnival games, magician, fortune teller, moonwalk, arts and crafts, face painting, mad scientist’s lab and pony rides. Also, don’t miss the Theater of Terror! A pizza dinner is included along with a goodie bag and a visit to the Pumpkin Patch. Wristbands will be issued upon check-in at the event and will be required to participate in all activities. This family event is appropriate for ages 4 and up. View more information on the Wilmette Recreation Center website. - This non-frightening annual Halloween event is hosted by the Evanston Ecology Center. This year’s theme is “Alien Invaders.” It will showcase plants and animals that are invasive to Evanston. Learn about these “aliens” and find out what they like so much about Evanston! You’ll meet these characters (costumed volunteers) outside as you travel around the Ladd Arboretum; then you’ll enjoy snacks at the Ecology Center. More information is available on the Evanston website. - Friday evening brave souls are invited to partake in the thrills and chills of our superbly scary Haunted House. Your whole family will also enjoy a bonfire, DJ and more. On Saturday enjoy family-friendly entertainment, balloon dudes, both indoor and outdoor games, and hay rides, with plenty of Halloween treats available for purchase. Children under 7 years of age may take a walk through our haunted house with the lights on! Then, as Saturday evening arrives, once again, enjoy a bonfire, DJ (and corn roast) in the Park. For more information on Halloween Hoopla 2012, please visit the Jewett Park Community Center website. Living on the North Shore has a lot to offer and I hope you and your loved ones are able to get out in the community this weekend to enjoy these events. As always, I’m here if you’re interested in buying or selling a home on the North Shore! I’d love to walk with you through any questions you have about the North Shore Real Estate market and how I can help you successfully reach your real estate goals.